Lily has been painting full time for over 10 years, exhibiting widely throughout the UK, with work now featuring in collections worldwide - including Europe, North and South America, Africa, and Australia. Lily exhibited overseas for the first time in 2012, with two shows in Barcelona, and one in Amsterdam. Lily's work reflects a love of nature, instilled from an early age. Her canvases often feature natural subjects en masse, such as birds, Koi carp, or butterflies, in glorified representations. Work is often oriental in style; Lily is greatly influenced by eighteenth century printmakers such as Hokusai and Hiroshige, and Japanese kimono design. Lily is interested in finding out what it takes to create an appealing aesthetic - how to create a 'flow' and an energy. For Lily this involves striking a balance between presence and absence, dark and light, one color next to another, symmetry and asymmetry, adding and taking away until something is 'right'. 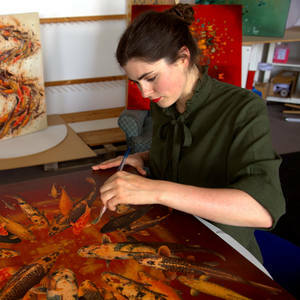 Lily has developed an innovative technique using her own paintings as collage material to produce a final piece. For example, butterflies are meticulously hand-painted, then reproduced, cut, and arranged in a composition on the canvas. Washes of inks are applied, and sometimes hand-painted or drawn details, before a clear gloss varnish is added, securing the work and adding an opulent lustre.